Ursula Rains first immigrated to the US following WWII. She worked in the San Diego District School system until her retirement. As a means of losing weight, Ursula began running and it did not take long before she started moving up in her age group to the top step of the awards and relinquished it very rarely – to the second step only – she was an awesome athlete. Ursula was also one of the kindest team mates ever – she was always there to help and contribute. One year at the La Jolla Half marathon, one of the runners, Mary Storey, fell while heading down the steep La Jolla Cove Road. The EMTs arrived and, although 100 meters from the finish, they would not allow her to continue – loaded Mary into the ambulance and off to the hospital. Ursula immediately went to meet Mary at the hospital and stayed the day with her until Mary was able to be discharged home. Mary always spoke about how very kind Ursula was – to the point of getting Mary’s shoes and helping her put them on. She then drove Mary home and got her settled in.Ursula was also the Queen of Carlsbad 5K and ran every one until her death in 2006. Carlsbad 5K consisted of 6 races over the course of a morning – at the 2006 race, Ursula was honored at the start of every single race. Ursula was one of the world’s great chefs and gardeners – she could grow anything and she shared all the fruitful proceeds of her labor of love. 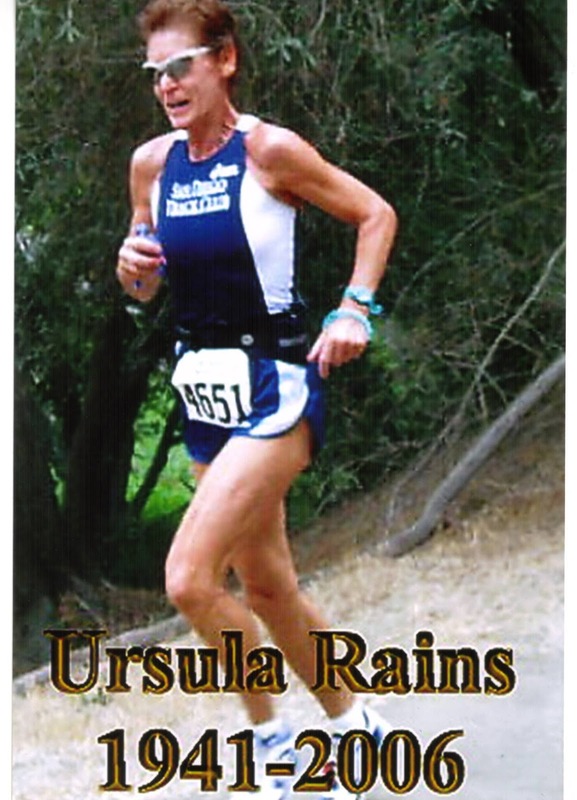 Ursula died )following an accident during a run in Balboa Park (she actually completed her workout and was running to her yoga class) – while crossing a road she was struck by a car and despite fighting for many months, eventually succumbed to her injuries. With a love of the outdoors and adventure, Ursula climbed Mount Whitney multiple times and the plan at her death was to cremate and spread her ashes over Mt Whitney – so she could rest where she was so very happy. It is not possible to communicate how very much we miss her smile, laughter, kindness and friendship. To know Ursula was something special and I treasure her friendship and my photo with her at her last Carlsbad 5K – she was an awesome lady.